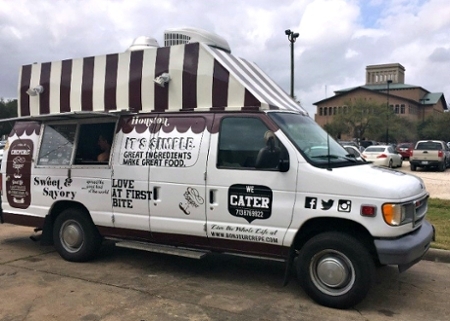 University of Houston Dining Services welcomes Bonjour Creperie to the UH food truck program. Bonjour Creperie, an authentic creperie food truck, delivers a collection of sweet and savory crepes filled with a variety of toppings. Owner Czarek Brylski fell in love with his grandmother’s crepes as a child and his passion soon developed into a successful food truck business. Customers can select from a collection of savory crepes like a fresh salmon galette with cream cheese and a lemon garish or a pepperoni galette filled with pepperoni, tomato and slivered red onions. Dessert indulgences crepes including items such as a Nutella crepe or a Kinder Crepe, which is filled with white chocolate chips, dark chocolate chips, roasted hazelnuts, whipped cream and powdered sugar. Visit the UH Dining website for more information about Bonjour Creperie.